The concept has been put forward by Dutch group Fairplant, which saw a fair amount of traffic at its stand during the trade show Interpoma held in Bolzano, Italy late last month. Whether it be innovations like the Avoseedo or simple herb garden starter plants in the supermarket aisle, retailers are increasingly capitalizing on consumers’ desires for sustainable, home-grown produce. 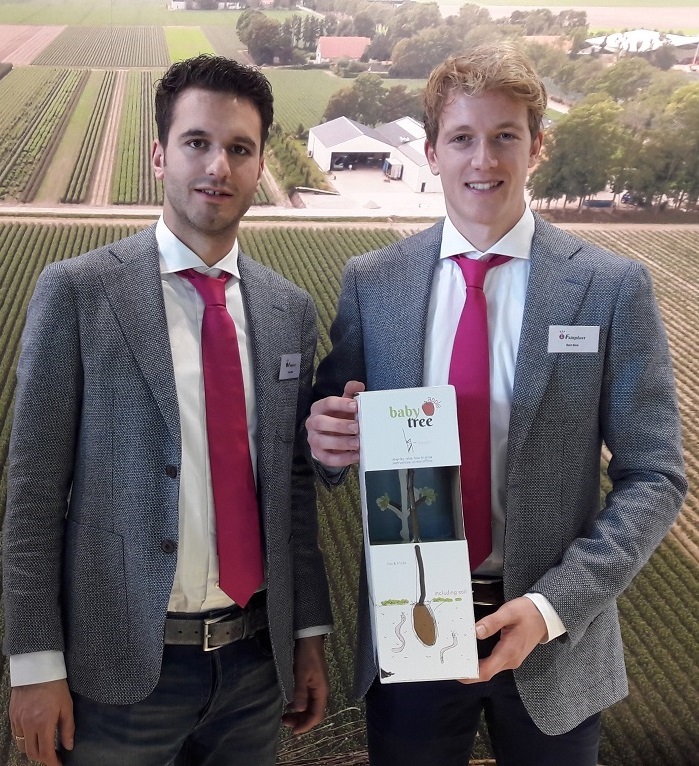 In this vein, Dutch rootstock grower Fairplant BV has introduced its ‘Baby Tree’ concept which has potential at both consumer and business-to-business levels. “This product has an educational value – it’s something you put in the ground or in a pot in your garden or your balcony, wherever you want, and anybody can do it,” says the concept’s creator Bart Blok, whose father Gerard Blok owns the company. Every plant comes with a unique number that can be registered online for tips and how to care for the baby tree through the “Fairplant Academy”. “We count in springs, so you plant it between January and July in a pot or in the ground, and then it takes two springs,” said the 24-year-old. “After that it’s a tree of 2.5 meters (8.2 feet) in length,” he said, adding the group would also be trialing the concept in baby plum and cherry trees. Bart’s brother Chiel Blok, who is the company’s sales manager, said the innovation marked an expansion into the consumer market, building on Fairplant’s existing business with professional tree nurseries. “Almost 90% of our turnover is coming from abroad,” Chiel said of the rootstock business. “We are selling plants to almost every country inside Europe, but for a few years we’ve started doing exports to places outside of Europe, like China, North Africa, India, said the 27-year-old. He said initially the product would be aimed at Garden Centers and for giveaways, particularly during Christmas time because planting season is then just around the corner. If this proves successful, he mentioned supermarket sales could also be a possibility if retailers were willing to trial the product. Bart said trials prior to Interpoma were just through sales at Fairplant’s own nursery. “It’s good for business-to-business as a giveaway – people can put their own logo on it. And it’s also for the consumer market,” he said. Freshfruitportal.com was a guest of the Italian Trade Agency, which invited more than 80 buyers and journalists to the trade fair.